A USCIS Field Office in California approved both our client’s Form I-751 petition to remove conditions on residence and Form N-400 application for naturalization in a single naturalization interview, held in early March 2019. With the conditions on his residence now removed, he is set to attend his naturalization oath ceremony and become a U.S. citizen. In many cases, conditional residents are eligible to file for naturalization before the conditions on their residence are removed and they get the regular, 10-year green card. Persons who are granted marriage-based permanent residence when the marriage to the U.S. citizen petitioner is less than two years old are issued a two-year, conditional green card. To get the conditions removed and maintain lawful permanent residence, the applicant and his spouse must file a joint I-751 petition before the two-year card expires, and no earlier than 90 days before the expiration. There are only three types of waivers (exceptions) to the joint filing requirement. Continuous residence is one eligibility requirement for naturalization. You must reside continuously in the U.S. for at least 5 years as a permanent resident at the time you file your naturalization application. An exception is if you are a qualified spouse of a U.S. citizen, in which case your continuous residence must be at least 3 years at the time you file for naturalization. Continuous residence for naturalization purposes begins on the start date of your permanent residence, even if it is conditional. As of June 2018, USCIS began issuing Receipt Notices for I-751 petitions that automatically extend the conditional resident status for 18 months past the expiration date of the two-year card. Previously, the extension was for 12 months, after which the person would need to obtain a temporary I-551 stamp (evidence of conditional residence) at a local USCIS office. The change was made to accommodate longer processing times for I-751s and to allow conditional residents to automatically keep their lawful status and maintain work and travel authorization in the interim. Our client’s naturalization interview was scheduled before he received a decision on the Form I-751 petition. At the naturalization interview, the USCIS officer exercised his authority to approve the I-751 even though it was still sitting at a USCIS Service Center awaiting adjudication. 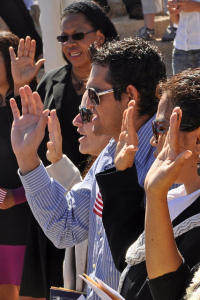 This cleared the way for the conditional resident to become a U.S. citizen. Although both the Form N-400 and Form I-751 may be pending at the same time, the I-751 must always be filed first. A conditional resident may not become a naturalized U.S. citizen until the I-751 petition is first approved. In December 2017, we filed a timely, joint Form I-751 petition with the USCIS California Service Center in Laguna Niguel, California. To demonstrate the conditional resident entered into and continued to have a good faith marriage with his U.S. citizen spouse, we submitted affidavits describing their relationship, shared car insurance policy, joint bank account and credit card account statements, and evidence of their home ownership. The I-751 was initially transferred from the California Service Center to another USCIS Service Center. In June 2018, we received a Transfer Notice from the Service Center in Arlington, VA stating it was transferring the I-751 back to the California Service Center to speed up processing. Then in December 2018, we received a Transfer Notice from the California Service Center stating it completed a preliminary review of the petition and was transferring the case to the National Benefits Center in Lee’s Summit, MO for adjudication. The I-751 had been pending with USCIS for 10 months when the naturalization application was filed. Within three months of receiving the Form N-400, our client received his naturalization interview notice. It did not instruct him to have his U.S. citizen spouse accompany him or to bring evidence of their bona fide marriage. Nonetheless, I counseled him to do so, particularly because USCIS had yet to approve the I-751 petition and lift the conditions on his residence. The naturalization interview started off with his completing and passing the Civics Test and English Test. Then the USCIS officer went through his naturalization application, page by page. 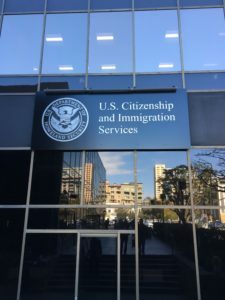 To prepare for the naturalization interview, my client and I had discussed potential questions about his marriage to the U.S. citizen petitioner, their relationship history, and his U.S. immigration record. Among his concerns was that he had been previously denied entry to the United States as a visitor by the U.S. Customs & Border Protection, after being employed in the country on a temporary worker visa for an extended period. I advised him on how to best respond truthfully to this issue, which did end up being raised by the USCIS officer at the interview. When the USCIS officer stated he would approve the N-400 application, I reminded him the I-751 petition was still pending. The officer was not aware of this because the file had not been flagged. He agreed to call in the U.S. citizen spouse, who had accompanied us to the Field Office and was seated in the waiting room. Both the conditional resident and his spouse answered questions and presented documentary evidence on the bona fide nature of their marriage. At the end of the interview, the officer said he would also approve the I-751 petition. Even though he did not have the original I-751 filing, and did not review the copy we had with us, he favorably adjudicated the petition based on the testimony and evidence presented. We expect him to be scheduled for a naturalization oath ceremony and to become a U.S. citizen. This is a true success story. Getting Visas and Immigrating to the U.S.
Posted on November 25, 2014 | Comments Off on Getting Visas and Immigrating to the U.S.
Are you a foreign national who wants to study, work or live lawfully in the U.S.? Getting a visa or immigrating to the U.S. can be very challenging. And it’s life-changing. In this 1-minute video, I explain briefly how I’m qualified to help you in immigration matters. Comments Off on Getting Visas and Immigrating to the U.S.
Filing for naturalization is relatively simple when compared to applying for a green card. Becoming a U.S. citizen is generally recommended: you get to vote for elected officials, obtain federal jobs, sponsor immediate relatives for green cards, travel freely with a U.S. passport, and gain immunity from deportation or removal. But the naturalization process opens you up to further scrutiny by the U.S. Government. You are inviting U.S. Citizenship & Immigration Services (USCIS) to review your entire immigration record. So beware of the pitfalls. Fraud, lies and misleading statements that were previously overlooked could come to USCIS’ attention when you file for naturalization. In some cases, the misrepresentation is innocent, unintentional, or purely out of embarrassment. In others, a finding of misrepresentation is based on USCIS’ faulty reasoning or misguided assumptions. Either way, you are on the defensive. If USCIS finds that you previously committed fraud, lied, or made misleading statements to the U.S. government or to gain immigration benefits, it may deny your application. Even worse, you could be placed in removal proceedings and risk losing your permanent resident status. Furthermore, through denaturalization proceedings, a citizenship grant may later be revoked based on a fraud finding – leaving you with no status. Case #1: Natalia is granted lawful permanent resident status based on an approved Form I-360 (religious worker) petition. 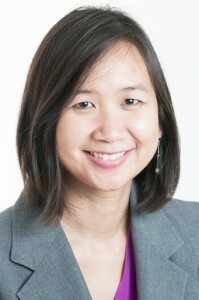 After being a permanent resident for five years, she files for naturalization. USCIS then investigates the religious organization that petitioned for her and finds that it does not exist and was not in operation when it filed the I-360 petition for Natalia. USCIS concludes that Natalia never worked for the religious organization. Case #2: Sergio is granted a K-1 visa based on a Form I-129F petition that his U.S. citizen fiancée filed for him. After arriving in the U.S., he marries his fiancée within 90 days and files his Form I-485 application to adjust to permanent resident status. The USCIS Service Center grants him conditional resident status without an interview. Two years later, Sergio files a timely Form I-751 petition to remove the conditions on his permanent residency. The USCIS Service Center approves the petition without an interview. After being a permanent resident for three years, Sergio files for naturalization. At the naturalization interview, he reveals that he is separated from his U.S. citizen spouse and that they no longer live together. USCIS then conducts an investigation that leads them to believe the couple entered into a sham marriage to gain immigration benefits. Case #3: Maya enters the United States on a tourist visa and files for asylum within one year of her arrival. On her asylum application, she falsely claims her brother as her spouse with the hope that he can later come to the United States as a derivative beneficiary. She next enters into a bona fide marriage to a U.S. citizen, who files an immigrant petition for her. USCIS approves Maya’s marriage-based green card application, which does not list any prior marriages. When Maya applies for naturalization, USCIS reviews her file and finds the asylum application. USCIS requests the divorce decree showing that she terminated the prior marriage, which she claimed on her asylum application. USCIS wants the divorce decree to confirm whether Maya was legally free to marry her U.S. citizen spouse. Maya cannot produce the divorce decree because the spouse she claimed on her asylum application is actually her brother. Case #4: Igor enters the United States on an immigrant visa based on an I-130 petition that his lawful permanent resident mother filed for him. But between the time his mother filed the petition and the time he obtained the immigrant visa, Igor secretly married his high school sweetheart without their parents’ consent. Igor is unaware that the marriage disqualified him from immigrating under the family second-preference category, which applies to unmarried (but not to married) children of permanent residents. During the naturalization process, USCIS investigates Igor’s immigration history and discover the marriage certificate. These cases are common scenarios that attorneys are asked to evaluate after the applicant has already filed for naturalization and is now facing a denial or a Notice to Appear in removal proceedings. The better choice is to consult the attorney before you file for naturalization. Fraud, lies and misleading statements go hand in hand with whether you lawfully obtained your permanent residence and meet the good moral character requirement to qualify for naturalization. If you did not qualify for permanent residency in the first place, then you are not eligible for naturalization. And to naturalize, you must show that you have been a person of good moral character during the statutory period. In general, the statutory period begins 3 to 5 years prior to filing the application. USCIS can also consider bad acts before the statutory period, if during the current 3 or 5 year period, you haven’t shown rehabilitation, or if the past bad acts relate to your current moral character. All applicants must show they continue to be a person of good moral character until they naturalize. Giving false testimony, under oath or affirmation, to obtain immigration benefits during the statutory period prevents you from showing good moral character. This mandatory bar applies even if you were granted a waiver of misrepresentation during the green card application process. Past misrepresentation or misrepresentation on the naturalization application itself or during the naturalization interview may lead to a denial of your application. Although rare, your citizenship can also be revoked through “denaturalization” if USCIS later discovers the misrepresentation. When a denial is without prejudice, you may reapply for naturalization after a certain period has passed. But you might not get a second shot. Instead, you could face deportation. If you don’t qualify for any relief or if your request for relief is denied, you risk losing your permanent resident status and being ordered removed from the United States. Talk to an attorney before you file for naturalization. A qualified attorney can help you determine whether you qualify for naturalization, present negative facts in the best light possible, and pinpoint red flags that may lead to a denial and/or put you at risk of removal. The attorney can also help you evaluate a denial and determine whether to appeal it, file a new application later, or let things be.